This page contains sponsored content and affiliate links. Regardless, only products and services I trust are recommended. Thinking seriously about starting your own business? 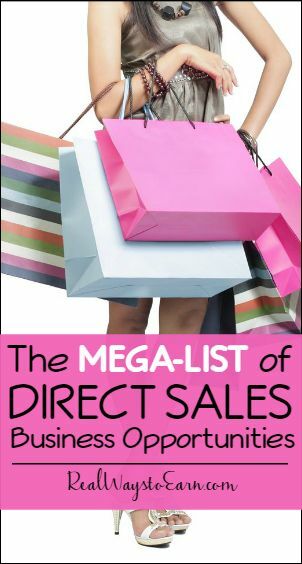 There are a ton of direct sales companies across a variety of categories you can get set up with quickly. Browse the listings below to find the perfect company for you. Many of these have inexpensive start-up options and offer superior products. Want to see your listing here? See the bottom of this page for more details! My name is Samantha Spader and I am an Independent Stylist with J. Elizabeth Boutique. I am a stay at home mom to a toddler and also going to school full time! I am so excited to share this opportunity with you. Unlike other clothing businesses that make you purchase large quantities of clothing to start this company does not. There is a kit option for 65$ or you can sign up without the kit. Either way there is a minimal 10$ monthly fee for the website. I would love to sponsor anyone who is truly interested, don’t be afraid to reach out if you have questions! Earn commissions and bonuses when you meet and surpass your sales goals, such as diamonds, homewares, trips and more. Ability to set your own schedule. Get discounts on auto insurance, at office goods stores, and other retail locations, just for being a Mary Kay beauty consultant. A Starter kit which costs $100 but comes stocked full of amazing products valued at way over the $99 price. Get full-sized skincare and beauty products plus an entire set of foundations to launch your business. Free training, coaching, and incentives to become a leader in your business by recruiting others to start a Mary Kay business. You’ll even be able to earn monthly commissions from your team’s sales. A sisterhood of women who will help you grow as a beauty consultant and a woman. The possibility to earn a Mary Kay Career car! This is a fully paid for vehicle that you can proudly drive and show your success in the business. If you are looking for a sisterhood where you can build a business and empower women, c’mon girl, we can’t wait to meet you. We have a team of girls and leaders waiting to support you and help teach you all.the.things. Our founder leads by example, making Maskcara Beauty the premier opportunity that is exploding all over our country! To learn more, email me at bethanybalsis at mac dot com or text me at 703.220.9390. I have an artist opportunity packet waiting for you. Our incredible team will support you every step of the way. As soon as you join, you will be tapped into my personal network which will give you access to tools that will help you start your business strong. You will also be tapping into the incredible resources that our corporate office has prepared to help build your business. Additionally, we have a great compensation plan that is designed to help you earn back your investment in your first 30-90 days, and begin building your long-term residual income. This is a “turn-key” business, meaning that you can build a business and make profit in just a few months— there is no inventory, no shipping costs, and you don’t have to host parties to make money. By leveraging technology, we are a virtual franchise and we have revolutionized the way business is done through social commerce. Incase you didn’t know, Rodan and Fields was created by the same Doctors that created Proactiv. Think about this… What if you were asked to partner with the Doctors back in the 90’s when they first launched Proactiv, can you imagine where your life would be today? These are the same Doctors, but with a bigger anti-aging industry brand and market. Are you interested in joining my team? Fill out this quick survey below, and I will be in touch soon. The Thrive Experience is Non-GMO and gluten-free. Le-Vel uses premium grade ingredients, which is why you see it sweeping the health and wellness industry. In this instant gratification society we live in, the high impact results are exactly what people are looking for! I'd love to connect with you and see if Le-Vel is the right fit for you. Call/text me at 715-495-8432. Independent Brand Promoter LV-523185-DL. Click here to connect with me on Facebook | Click here to get your Free Le-Vel account set up! Sign Up to Sell doTerra or learn more about it at The Lightsome Life. Watkins is a company I'm very proud to be associated with as an Independent Watkins Consultant because it aligns with my personal values. We use and love the natural products everyday. I didn't realize it at the time, but joining Watkins turned out to be a life changing decision for me and my family. I enjoy so many rewards personally, professionally and financially as a direct result of my Watkins business. My life is richer in every facet because I said yes and joined! • Receive a discount on Watkins award-winning, premium quality, affordable natural product line of gourmet foods, home care, body care, and tried-and-true remedies. • Earn commissions and additional bonuses paid on volume and Leadership. • Ultra-low Start-Up Costs only $29.95 to join. • Free training, coaching and outstanding support. Build a life-changing business representing North America's oldest and most respected direct sales company. Get all the FREE details today! Work right from your laptop or phone, no experience necessary! Training provided. Qualify for weekly $100 bonuses for life! I am an Ind Distributor for IT Works Global (known for our Ultimate Body Applicator that firms, tones and tightens in 45 minutes) and I'm looking for motivated individuals to join our team who want to share this opportunity with others. No direct sales experience needed ~ follow our Steps to Success for unlimited earning potential with our amazing compensation plan and bonuses. Become an It Works! distributor and live a life of friendship, fun and most of all FREEDOM! Our product is affordable for the masses. It costs $39.99 to $49.99 depending on whether it's a one-time order or a monthly recurring order. This is as low as $1.33 for a cup of coffee with amazing benefits. Way cheaper than the coffee store on the corner! Turn your flower arranging skills into a way to earn extra money, or even a full-time income. Alice's Table enables women to launch their own flexible and creative business by leading flower arranging events. This opportunity was recently showcased on SharkTank! It's a great way to earn money, have fun being creative with a group of your friends, and teach some new skills to others. Sell scrapbooking and paper crafting kits. Your kit to get started is just $99 and includes all kinds of scrapbooking and paper craft items. You can earn up to 22 percent commission on your sales. This opportunity is open to people in the US and Canada. Do you love to organize, keep notes, journals and calendars as you go through your life month by month? Do you love paper products, stickers, and to-do lists with flair? Would you like to get paid for something you love to do? Regardless if you are already a seasoned “planner” or not, we have the tools to get you started! We invite you to join a company from the ground level and how much you make is all up to you! Set your own goals! Our Brand Ambassadors each have different goals. Some just want to share their passion and interest and network with others while making enough to pay for all the products they want to add to their collections and others shoot to increase their incomes while doing something they love. Our new catalog is available at: https://issuu.com/the1407planners/docs/catalog_spring. Elleetula.com is where you can find more information about our company, how to join, and take a look at what our Brand Ambassadors are accomplishing! Elegance Inc. is a new social retailing company. We are currently focusing on celebrity loved high quality fashion jewelry, but we have plans to expand our line to include other elegant products in the future. We pay 25% to 40% commission depending on your Paid as Title in the Elegance Inc. Success Path. We offer monthly customer specials and our Boutique Owners can host as much as they would like and earn Socialite (hostess) rewards. We also offer a great charity program! Elegance Inc. is truly about empowering women. With Elegance Inc. you cannot lose your downline, you can will or sell your business, we offer maternity and emergency leave, and even a retirement program. You can sell for other companies while you are with Elegance Inc. We give you options and the power. With Elegance Inc. you truly OWN YOURSELF!!! Go here to get started with Elegance Inc. Become a Stella & Dot stylist and sell beautiful, high-quality jewelry from one of the best known direct sales companies. It's possible to earn up to 25 percent commission on your personal sales. If you build your downline, you can also earn a nice commission on the sales of your team! Kaeser & Blair offers a flexible, risk-free opportunity selling promotional products in an industry that does over $21.5 billion in sales each year. Earn up to $20,000 annually as a part-time business owner, and up to $185,000 annually as a full-time business owner. Getting started is simple and inexpensive, with standard basic starter packages costing only $85 – the entire amount of which is refunded after your first $1500 in sales. K&B also offers a FREE Trial Launch Program, so you can try the opportunity before you fully commit. Sign Up For Your FREE Trial Launch Program, so you can try the opportunity before you fully commit. Open a world of possibilities with Usborne Books & More. Whether you are looking for an exciting career with a potential six-figure income or to add just a few hundred dollars a month to your income working a few hours a week … Usborne Books & More has an exciting opportunity for you to make a difference in children’s lives. Thousands have discovered life-changing opportunities with Usborne Books & More. Make the next chapter in your life a great one, and join my team today. Only one listing per direct sales rep and/or company allowed. This is so reps from the same companies do not have to compete with each other. Companies are listed in alphabetical order beneath categories so I'm not personally giving preference to any one company. At this time, I do not offer additional advertising to bump your company to the top. First come, first serve. I don't hold or reserve space for anyone, nor do I keep a waitlist for space. Note that the rate is subject to change at any time, however what you pay at the time of purchasing advertising will be your rate until your year of advertising is up. This is not an automatic charge, you will be notified at the end of your advertising year to see if you'd like to renew your space. My rates change periodically, so your rate for this year may not be the same for your next year of advertising. Unfortunately, I'm not able to offer refunds after advertising has been purchased, or offer payment plans. Thanks for understanding! If you want your listing added to this page, please contact anna (at) realwaystoearnmoneyonline (dot) com and put “Direct Sales Advertising” in the subject line. I look forward to hearing from you!